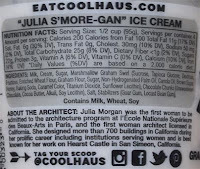 Coolhaus isn't new to the blog, but all of the past reviews have been written by Nick. In the fall I realized that Shaws was starting to carry their products and now Wegmans and Price Chopper is too. PC only had four flavors Friday night, but one of the them was just too hard to resist. That is a good way to start a pint! 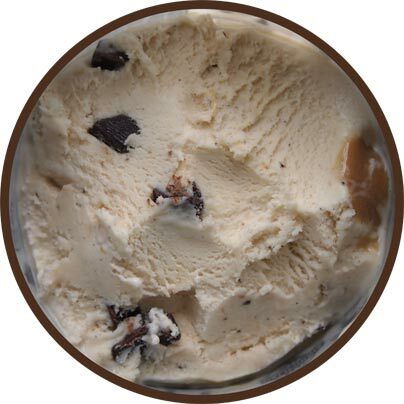 I'm going to cheat and roll all of my scoopings in to one big review because the reality is that I've scooped this pint several times over the last 24 hours and splitting up my thoughts is useless at this point. Overall, yes, I am enjoying this one. If I had to sum it up quickly, I would say it like this: "Nick would like this flavor". They use graham flour in the mix and it adds that bit of a complex graham kick that he always enjoys. I enjoy a more traditional, sweeter, non-"spicy" graham base. It's neat to have once in awhile, but nothing I would gravitate towards regularly. I mentioned this being my first Coolhaus experience. Obviously this isn't the same as going up to one of their trucks and getting the true taste of a freshly crafted ice cream sandwich, but this will be the only Coolhaus experience that many of us get. 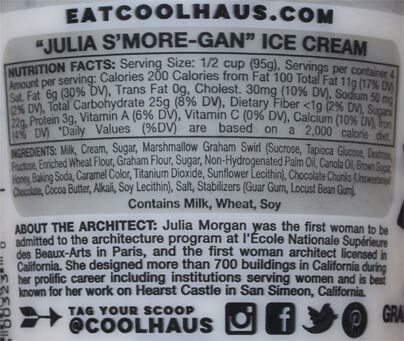 Too many words aside, my biggest surprise with Coolhaus is how gummy the ice cream is. I expected a fairly unique flavor, which I did get, but it's still weird to me how much an all natural flavors can rely on stabilizers. I get that they need a product that can handle transport and waiting on the shelf for someone to grab it, but man, this would have been so much better with a gum-free texture. Oh, I should mention the "salty" factor. It's part of the larger equation here and doesn't stick out in any particular way. I like to think I notice salt in general because I'm not a fan of when it's overdone, but it totally blends in with everything else here. It's taking things up a notch and nothing more. Don't be afraid if the name scared you a little. So, between the kick and the texture, this isn't something I would regularly pick up at $5.99 a pint. That said, I still had fun. This pint was still more than good enough to try the others flavors even if it's just to experience the flavor profiles and not the texture. 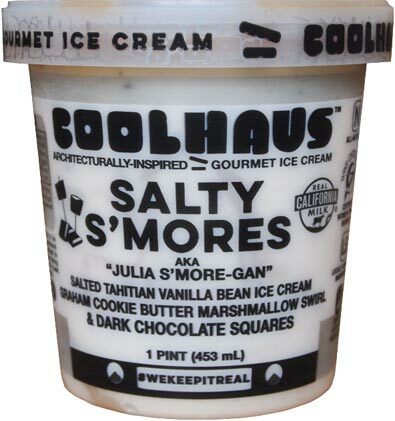 Ok, the floor is open, who else is seeing Coolhaus on their store shelves? Update: after interacting with Coolhaus on social media, I actually received an email from them about this flavor. It turns out that the texture of this one is on purpose and meant to mimic the texture of a s'mores (aka the squishy marshmallow part). I did not expect this (I blame Breyers, Edys, Friendlys, etc). As always, I am leaving the review as is, but this has been an interesting development. I am now stoked to try my next pint of Coolhaus. Their fig flavor is by far their best one. The pints I've had are always to slim on the mixins (chocolate molten cake, etc) to stand out. I like the balsamic gig, as well. Their mint chip is nice (they use mint leaves and they give it's nice freshness). Salted caramel is good. The chocolate molten cake is not my favorite. I've never seen this flavor in my local stores. I loved this, best point of ice cream I've had this year, by far. My Meijer also carries the mint and legs cake and some sandwiches, but I haven't tried this yet. Ive had a few pints of theirs and have had barely any mix ins. Very disappointing esp for the price you pay. I liked but didn't love this flavor. My brother, however, thought it was incredible. I think I wanted a little more graham flavor and a little more salt (not heavy salt .... just a bit more to bring the other flavors out more). Yes, more mix-ins would have been nice, but I don't think the way they did it is a deal breaker. That said, it could be argued that the price point is a bit high for what you get. The ice cream sandwiches are always incredible, though. I'm new to this brand,and found it in "Fresh Market." I tried the vanilla, and it was easily the best high quality vanilla ice cream I've ever had in my life. (I'm over 65,and have been around the block,ice cream wise.) LOL What an incredible taste and texture. 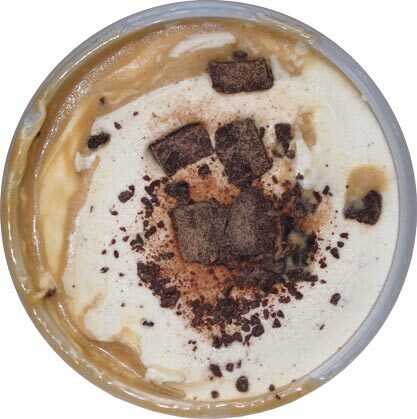 If intense vanilla taste and super duper thick rich creamy is your thing, give it a try! It truly tastes as if if was just churned at a church picnic or something. Worth every calorie.